In addition to the ‘Daily Dozen’ exercises, the 3rd edition of Handwriting for Heroes includes a special ‘Baker’s Dozen’ created by Dr. Amanda Sammons, an Army occupational therapist. This newly developed section helps you cultivate a positive attitude and “MIGHTY Mindset” throughout your course of recovery and handwriting skill development. 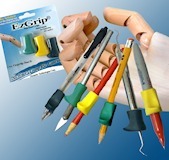 Edward George Bulwer Lytton said, “The pen is mightier than the sword”. Writing is a very powerful tool, and gains more strength when coupled with a positive attitude to influence the thoughts behind your writing. The ‘Baker’s Dozen’ offers positive psychology exercises to promote optimism and resiliency in your daily life. One of the primary aims of positive psychology is to help people to discover, explore, and improve on their personal strengths. This can be done through a variety of deliberate exercises to train your brain to attend more to your positive experiences and focus less on the negative ones. Throughout this program you will complete a positive psychology exercise each day. The word MIGHTY is used as a mnemonic to help you remember each of the positive psychology exercises that you will learn during your journey to change hand dominance. Each week focuses on a different aspect of positive psychology. Apply each to your day-to-day life regardless of where you are in the process of changing your hand dominance. In fact, these exercises should become part of your daily routine for you to continually cultivate a positive attitude and mighty mindset. Thank you for H4H! I am ordering another copy! Do you know of a one handed computer program that you would recommend? Thank you! Thanks for the query, Cecilia, we will be putting together a new blog post this week with some ideas. Previous Previous post: Relearning print writing – new for 3rd Edition! 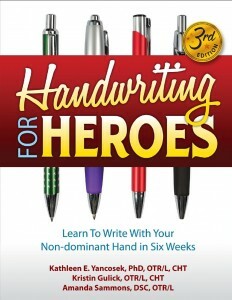 Next Next post: Handwriting for Heroes 3rd Ed. now available!